SAN ANTONIO, Texas -- Veteran public affairs executive and educator John M. Puder was appointed Executive Director of the ¡Adelante! 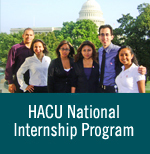 U.S. Education Leadership Fund, a national Hispanic scholarship and leadership program. The ¡Adelante! Fund utilizes scholarships, leadership training and internships for developing today’s Hispanic scholars into tomorrow’s national leaders. “I’m excited to join an organization that is building role models and leaders for the nation’s youngest and largest ethnic population,” Puder said about the non-profit program that each year provides Hispanic college juniors and seniors throughout the country with scholarships, internships and leadership training. “We have a crisis in Hispanic education, and we’re losing far too many students who are not graduating from college. Our challenge is to provide students with the tools and support network to succeed as future leaders” Puder said. The ¡Adelante! U.S. Education Leadership Fund is a 501 (c)(3) non-profit corporation that was founded by the Hispanic Association of Colleges and Universities (HACU) with the support of Miller Brewing Company in 1997. The ¡Adelante! Fund became a separate organization in 1999 and has supported students at more than 30 Hispanic-Serving Institutions. “Under John Puder’s effective leadership, ¡Adelante! Will continue to thrive as a HACU sister organization to advance Hispanic success in higher education,” said Antonio Flores, President and CEO of HACU and the ¡Adelante! Board Chair. The ¡Adelante! U.S. Education Leadership Fund each year provides scholarships and paid internships. Selected recipients also participate in the !Adelante! Fund Institute for leadership training and professional development. Recipients are selected from juniors and seniors attending Hispanic-Serving Institutions and must maintain a 3.0 grade point average (GPA). With the support of corporate and private donors, selected students receive annual scholarships worth up to $3,000, earn paid summer internships with participating corporations and attend the annual ¡Adelante! Leadership Institute. The annual leadership institutes provide hands-on training for future professionals, introducing them to the expertise of national leaders in corporate management development, workplace diversity, networking, technology, communications, finance and public leadership. This year’s ¡Adelante! Leadership Institute is scheduled May 22-25 in San Antonio. With funding and ongoing support from the Miller Brewing Company, leadership institute sponsors also have included Texas Miller Lite, SBC Communications Inc., Bank of America, Continental Airlines, Southwest Airlines, Frost National Bank, Coca-Cola of the Southwest, Hispanic Magazine, Stein Mart, and TIYM Publishing Company Inc.
Puder, former managing partner for the public affairs consulting and fundraising firm Team Tejas, also is the former president of the public affairs and public opinion research firm Puder Consulting, and an instructor at the University of Texas at San Antonio. Puder previously directed community relations for the U.S. Air Force Outreach Program Office. Puder obtained his bachelor of arts in political science from the University of Texas at San Antonio and a Master of Public Affairs as a Barbara Jordan Scholar from the Lyndon B. Johnson School of Public Affairs at the University of Texas at Austin. For more information, contact John Puder, Executive Director, ¡Adelante! U.S. Education Leadership Fund, at (210) 692-1971, or by email at jpuder@adelantefund.org. Or visit www.adelantefund.org.